This course will provide examples of field-tested strategies on how to succeed in today's increasingly diverse classrooms. Educators will learn proven techniques on how to match instructional approaches to the readiness, interests and talents of all students. Teachers will examine learning centers, hands-on activities, contracts, and investigative projects. Educators will learn new ways of structuring lessons to provide "scaffolds" for lesson content and their learning projects. Educators will develop a written paper, lesson plans or activities for classroom applications and student achievement. 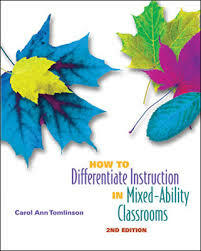 Educators will learn how differentiated instruction for mixed-ability groups applies to instructional strategies. State or local academic standards are also addressed. Teachers will examine the role of the teacher in a differentiated classroom setting. Learners are presented with strategies for managing a differentiated classroom and preparing students and parents for a differentiated classroom approach. Educators will learn to plan differentiated lessons by readiness, interest and learning profiles for classroom implementation. Teachers will be able to differentiate content, process, educational products and grading assessments in classrooms with mixed ability learners.